You are here: Home / HVAC Info & Articles / Articles / Why Does My Furnace Run Constantly? Does your furnace seem to be on more than it’s off? Are you beginning to wonder if there’s a problem? You’re probably right. Your furnace should not be constantly running. It’s a definite sign of a system malfunction and there are few common causes for this. 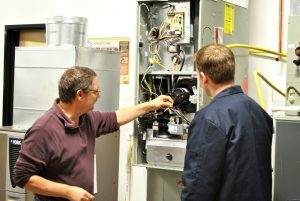 If it seems like your furnace never turns off, you should definitely call a reliable HVAC (heating, ventilation, and air conditioning) service for furnace repair in Burlington, NC. Blower issues. Is the air coming from your vents warm or cool? If your furnace is running but you’re only getting cool air, you may have a blower issue. It’s possible that an electrical issue is causing your blower to constantly run, like corroded wires. Do not attempt to work on the electrical components of your furnace yourself. Stay safe and call an HVAC professional for repairs. Dirty/clogged filters. If the air coming from your vents is warm, but the air flow is weak, it’s likely your filters are clogged with dirt and dust. Clogged filters keep the necessary air from getting into your furnace, resulting in failure to adequately reach your desired indoor temperature. Replace your filters with new clean ones and see if the problem corrects itself. If not, call for furnace repair in Burlington, NC. Thermostat issues. Make sure your thermostat is set to your desired indoor temperature and that it is set to the “auto” setting, not the “on” setting. “On” tells your furnace to run constantly. “Auto” tells your furnace to run until the desired temperature is reached. It will then shut off automatically until the temperature falls below the set temperature, in which case it will turn on again. If your thermostat settings seem correct, but the furnace continues to run, it’s possible you have a faulty thermostat. Call an HVAC technician to inspect, calibrate, or possibly replace it. Pilot light issues. Old furnaces sometimes have a pilot light that is supposed to stay lit throughout the cold season. If this goes out, you may find your furnace constantly running and blowing only cool air. You can relight your pilot following the instructions for you furnace. Most furnaces these days have electric start pilots that light automatically when the furnace calls for heat. It’s possible that somewhere within that mechanism there is an issue causing the pilot not to light. This can be repaired by your heating repair service. When your furnace is blowing cool air on a cold winter night or it keeps pumping heat without mercy, your home can become quite uncomfortable. If you find yourself in this situation, you need fast action. Alamance Oil Company responds quickly and offers reliable solutions to your furnace problems. Don’t suffer from the effects of a furnace that’s gone rogue. Call Alamance Oil Company at (336)226-9371 right away for furnace repair in Burlington, NC. https://www.berico.com/wp-content/uploads/2018/12/header-logo-new-3a.png 0 0 Berico https://www.berico.com/wp-content/uploads/2018/12/header-logo-new-3a.png Berico2017-08-29 16:33:302017-08-29 16:33:30Why Does My Furnace Run Constantly?